If I still had children of picture-book age, this is most definitely a book I would have and that I would read to them as often as I could. In thirty-two keenly illustrated pages, author James Gladstone and illustrator Christy Lundy manage to not only tell the story of Apollo 8 and the famous, iconic photo called “Earthrise” of the Earth with the gray, lifeless moon in the foreground, but also subtly capturing the mood of America at the time. It’s hard to describe how they manage to do this, but the opening paragraph and the style of art here serves as a reminder that this all happened a long time ago. The book is not just easy to read, but would make for a fun book to read aloud. It is quite amazing how much Gladstone manages to say with so few words. The key to this book, beside the subject matter, is the art by Lundy. There is just the right amount of picture and subject on each page to share with the young child, without being overwhelming. It has a style that is reminiscent of the 1960’s. And it has a high proportion of people of color (when we’re not seeing these early astronauts or NASA control center). It is a truly wonderful way to bring readers of all colors into a history that was admittedly pretty white. But the whole purpose of the photo, Earthrise, was, after all, to show that we’re all one people. One aspect of the book, the art, has to do with one two-page spread that shows the Apollo capsule “speeding the crew off to another world.” It’s a very simple page with mostly a starry background and the Saturn V engine falling away from the capsule. But the stars in the background have faint lines connecting them to show familiar constellations. It looks like a star-finder or constellation sort of book. But of course there are no visible lines connecting stars out in space and I haven’t decided how I feel about this in a children’s picture book that is otherwise quite accurate. The picture would admittedly be a little boring without this, but on the other hand, it would also show just how small we are when compared to the cosmos. I’ll keep thinking about this, but it will bring my rating of the book down just a little. Looking for a good book? 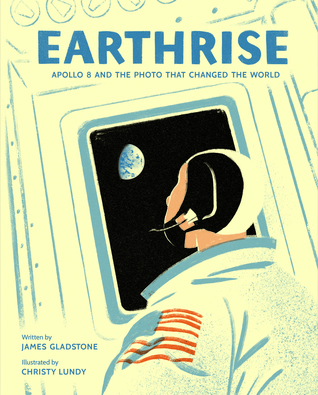 Earthrise by James Gladstone and Christy Lundy is a really tremendous picture book of an important moment in history and just in time as our space program is poised for more big events as these children grow.